PHYTOCHEMICAL SCREENING AND EVALUATION OF ANTIOXIDANT, ANTI-MICROBIAL AND ANTI-INFLAMMATORY ACTIVITY OF "CURCUMA CAESIA"
Girijananda Chowdhury Institute of Pharmaceutical Science, Azara, Hatkhowapara, Guwahati - 781017, Assam, India. ABSTRACT: The rhizomes of Curcuma caesia Roxb. (Zingiberaceae) Are traditionally used in the treatment of various ailments and metabolic disorders like leucoderma, asthma, tumors, piles, bronchitis, etc. in Indian system of medicine. Considering the importance of natural products in modern phytomedicine, the antioxidant and ant mutagenic activities of C. caesia Roxb. rhizome extract and its fractions were evaluated. The antioxidant results indicate that the free radical-scavenging activity may be attributed to the high contents of phenolics and flavonoids with a higher reducing capacity. The IC50 values of in-vitro and ex-vivo antioxidant activities of Curcuma caesia was found for DPPH scavenging activity was 1.08 ± 0.06 μg/ml, nitric oxide scavenging activity was 37.50 ± 1.54 μg/ml, Hydroxyl radical scavenging activity was 10.08 ± 2.01 μg/ml, Superoxide Anion scavenging activity was 29.63 ± 2.07 μg/ml respectively. The in-vitro antimicrobial activity of different fractions obtained from the rhizome of Curcuma caesia was investigated against standard strain and clinical isolates of Staphylococcus aureus. The clinical isolates were found more sensitive for different fractions, than the standard strain of S. aureus. The ability of rhizome of C. caesia extracts to inhibit the growth of test pathogen is an indication of its broad-spectrum antimicrobial potential which may be employed in the management of microbial inspection. 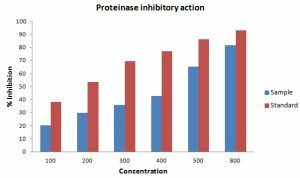 In-vitro anti-inflammatory activity was evaluated using albumin denaturation assay, membrane stabilization, and proteinase inhibitory activity at different concentrations. Aspirin was used as standard drugs. 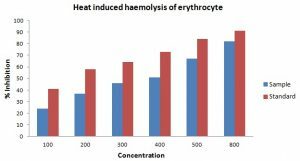 The results showed that Curcuma caesia ethanol extract at a concentration range of 100 - 800 µg/ml significantly protects the heat-induced protein denaturation; inhibit heat-induced hemolysis and proteinase action. The results obtained in the present study indicate that ethanol extracts of Curcuma caesia can be a potential source of anti-inflammatory agents. Phytochemical screening showed the presence of various components. INTRODUCTION: Plants are the most important sources of medicine. The term medicinal plants include various types of plants used in Herbalism, and some of these plants have medicinal activities. These plants have rich resources of ingredients which can be used in drug development and synthesis due to their therapeutic use. The use of herbs as medicine is the oldest form of healthcare known to humanity. Herbal medicines have become a popular form of therapy. They are often perceived as being natural and therefore harmless. Herbal medicines are also in great demand in the developed world for primary healthcare because of their efficacy, safety, and lesser side effects. Plant-derived compound (Phytochemical) have been attracting much interest as natural alternatives to synthetic compounds. Extracts of plants were used for the treatment of various diseases, and this formed the basis for all traditional systems of medicine. According to the World Health Organization (WHO), the developing countries rely on non-conventional medicine mainly of herbal sources. It is estimated that about 25% of all modern medicines are directly or indirectly derived from higher plants. The treatment and control of diseases by the use of available medicinal plants in a locality will continue to play significant roles in medical health care implementation in the developing countries 1. Inflammation is the response of living tissue to injury. It is a complex process, which is frequently associated with pain and involves occurrences such as the increase of vascular permeability, increase of protein denaturation and membrane alteration. It involves a well-organized cascade of fluidic and cellular changes. In many inflammatory disorders there is excessive activation of phagocytes, production of O2, OH radicals as well as non-free radical species (H2O2) which can harm surrounding tissue either by powerful direct oxidizing action or indirectly with hydrogen peroxide (H2O2) and OH radicals formed from O2, which initiates lipid peroxidation resulting in membrane destruction. Hence, the agents that can scavenge these reactive oxygen species can be beneficial in the treatment of inflammatory disorders as well as oxidative disorder 2. The present study was carried out to evaluate antioxidant and in-vitro anti-inflammatory activities and to screen the antimicrobial efficacy of Curcuma caesia against S. aureus with different standards. Chemicals and Reagents: Petroleum ether (PE), Ethanol (ET), dimethyl sulfoxide (DMSO), hydrochloric acid, Dragendorff reagent, Mayer’s reagent, Wagner’s reagent, Benedict’s reagent, sulphuric acid, lead acetate, Molisch’s reagent, Fehling solution A and B, Millon’s reagent, sodium citrate, copper sulphate, ferric chloride, sodium hydroxide, sodium chloride, glacial acetic acid, benzene, chloroform, ammonia, nitric acid, potassium nitrite, gelatin, Beef extract, Peptone and agar, albumin, trypsin, aspirin, tris buffer HCl, trypsin, disodium hydrogen phosphate, sodium dihydrogen phosphate. All the chemicals and solvents used were of standard analytical grades. Preparation of Rhizome Extract of Curcuma caesia: The fresh rhizome of Curcuma caesia was collected in October from Jonai, Assam. The plant was authenticated by the Department of Botany Guwahati University (Acc. No. 18378). The fresh rhizome was washed with distilled water to remove soil and other impurities, cut into small pieces and air dried for 2 days. The dried sample was again dried in a hot air oven at 50°C for 24 h, then ground into powder and pass through a sieve with a nominal mesh size of 2 mm diameter. The plant powder was loaded into Soxhlet extractor and subjected to extraction with ethanol. After extraction, the solvent from the filtrate was distilled off, and the extracts were concentrated on a water bath to get a dry residue which is then freeze-dried and kept in a desiccator. The crude extract was used for further in-vitro anti-inflammatory activity, antioxidant, anti-microbial and phytochemical screening. Preliminary Phytochemical Screening: The extract obtained from the extraction process were subjected to various standard qualitative test methods to determine the presence of various phytoconstituents such as alkaloids, glycosides saponin, flavonoids, carbohydrate, amino acids, steroids, etc. The concentrated extracts were subjected to a chemical test as per the methods mentioned for the identification of the various constituents 4, 5. Wagner’s Reagent Test: To 2-3 ml of extract, few drops of Wagner’s reagent are added by the side of the test A reddish brown ppt. Indicates test as positive. Mayer’s Reagent Test: To 2-3 ml of extract, few drops of Mayer’s reagent are added by the side of the test tube. A white or creamy ppt. Indicates test as positive. Molisch’s Test: To 2-3 ml of extract, few drops of an alcoholic solution of alpha-naphthol are added, the mixture is shaken well and 1 ml of conc. H2SO4 is added along the side of the test A violet ring formed at the junction of two liquids indicates the presence of carbohydrate. Fehling’s Test: 1 ml solution of Fehling’s A and Fehling’s B is mixed, boiled for 1 min. An equal volume of test solution is added. The mixture is heated in a boiling water bath for 5 min. If first yellow, then brick red ppt. is observed it indicates the presence of carbohydrate. Benedict’s Test: Equal volume of Benedict’s reagent and test solution is mixed in a test tube and heated in a boiling water bath for 5 min. Solution appearing green, yellow or red depending on the amount of reducing sugar present in test solution indicates the presence of carbohydrate. Legal Test: To alcoholic extract 1 ml of pyridine and 1 ml sodium nitroprusside is added. The appearance of pink to red color indicates the presence of glycosides. Borntrager’s Test: To 3 ml of extract, dil. H2SO4 is added. The mixture is boiled and filtered. To the cold filtrate, an equal volume of benzene or chloroform is added, shook If the ammoniacal layer turns pink or red on the addition of ammonia, it indicates the presence of glycosides. Ferric Chloride Test: To 2-3 ml of extract, few drops of 5% ferric chloride solution is added. A deep blue-black color indicates the presence of tannins and phenolic compounds. Biuret Test: To 3 ml of the test solution, 4% sodium hydroxide and few drops of 1% copper sulfate solution are added. The appearance of violet or pink color indicates the presence of proteins. Millon’s Test: 3 ml of the test solution is mixed with 5 ml of Millon’s reagent. The appearance of white ppt indicates the presence of proteins. Salkowski Reaction: To 2 ml of extract, 2ml of chloroform and 2 ml of conc. H2SO4 is added and shaken well. If the chloroform layer appears red and acid layer shows greenish yellow fluorescence it shows the presence of steroid. 1 ml of egg albumin, 14 ml of phosphate buffer (pH 6.4) and 10 ml of distilled water. 1 ml of egg albumin, 14 ml of phosphate buffer (pH 6.4) and various concentration of standard drug (aspirin) concentration of 100, 200, 300, 400, 500 and 800 µg/ml. 1ml of egg albumin, 14 ml of phosphate buffer (pH 6.4) and various concentration of plant extract concentration of 100, 200, 300, 400, 500 and 800 µg/ml. DPPH Radical Scavenging Activity: DPPH radical scavenging activity will be measured using the method of Cotelle et al., (1996) with some modifications. Three milliliters of a reaction mixture containing 0.2 mL of DPPH and 2.8 mL of the test solution, at various concentrations of the compounds will be incubated at 3 °C for 30 min, and the absorbance of the resulting solution will be measured at spectrophotometer. The percentage inhibition of DPPH radical will be calculated. Where; C is Absorbance of control and T is Absorbance of the test. Nitric Oxide: One milliliter of 10 mM sodium nitroprusside will be mixed with 1 mL of test solution of different concentrations in phosphate buffer (pH 4), and the mixture will be incubated at 25 °C for 150 min. From the incubated mixture, 1mL will be taken out, and 1 mL of Griess’ reagent will be added to it. The absorbance of the chromophore formed by the diazotization should be read, and percentage inhibition will be calculated by comparing the results of the test with those of the control using the formula mentioned in the DPPH radical scavenging assay. Hydroxyl Radical Scavenging Activity: The scavenging capacity for hydroxyl radical should measure according to the modified method of Halliwell (1992). Superoxide Radical Scavenging Activity: Superoxide anion scavenging activity will measure according to the reported method with some modifications (Robak and Gryglewski, 1998). The percentage inhibition will calculate using the same formula mentioned in the DPPH radical scavenging assay (Bala et al., 2009). Microbial Strains: Three bacterial strains [Staphyllococcus aureus (ATCC 25923), Escherichia coli (ATCC 25922) and one fungus [Candida albicans (ATCC 10231)] were used. Stains were obtained from Girijananda Chowdhury Institute of Pharmaceutical Science, Azara, Guwahati. Anti-Bacterial Activity: Bacteriological media is a wide range of types. Nutrient Agar is a complex medium as it contains ingredients with unknown amounts or types of nutrients. Nutrient Agar contains Beef Extract (0.3%), Peptone (0.5%), Agar (1.5%) and sodium chlorite (0.5%) in water. There are many media ingredients which are complex: yeast extract, tryptone, and others. The advantage of complex media is that they support the growth of a wide range of microbes. Agar is purified from red algae in which it is an accessory polysaccharide (polygalacturonic acid) of their cell walls. Agar is added to microbial media only as a solidification agent. Agar for the most purpose is not nutrient value. Beef extract, peptone was accurately weighed out, and in 1000 ml of distilled water beef extract, peptone is added. pH was checked by using pH meter (pH 7.4), and finally, Agar was added to the flask. Boil the media to dissolve & allow it to cool a few minutes. The media has placed an autoclave for sterilization, while the agar is still warm, but not hot for 20 min. Then the media is being taken from the autoclave and pour it is into the Petri dish labeled as test and standard. 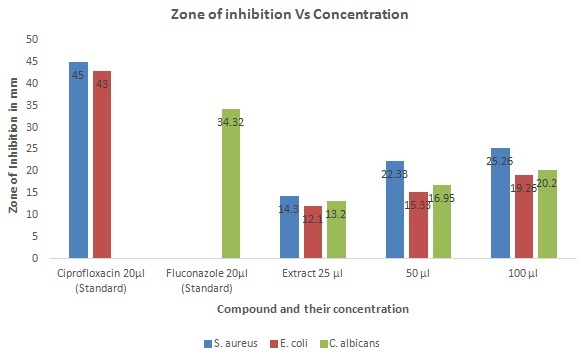 The antimicrobial activities of the test agents were determined by measuring the diameter of the zone of inhibition. Disc Diffusion Method: Antibacterial activity was done on nutrient agar media. 1 ml of bacteria suspension was uniformly spread on the sterile nutrient agar media. Ciprofloxacin (20 µg/ml) and DMSO were used as positive and negative controls respectively. Plant extracts were prepared in DMSO (stock: 1 mg/ml DMSO). The plant extracts of 10, 20, 25, 30, 40, 50, 60, 70, 80, 90 and 100 µg/ml concentrations were added. Sterile filter paper disc (Whatman no. 1, diameter 6 mm) was soaked with the extract solution and the solvent allowed to dry. The disc was placed on the nutrient agar media Petri dish inoculated with bacteria suspension to allow the extracts to diffuse into the media. The Petri dish was then placed in an incubator for 24 h at 37 ºC. At the end of the incubation period, the inhibition diameter was measured using calipers and expressed in millimeters. Positive antibacterial was established by the presence of measurable zones of inhibition. Antifungal Activity: The Sabouraud agar media is a type of agar growth media containing peptones were prepared and inoculated with a fungal culture. Petri plates containing 20 ml Sabouraudagar media was seeded with bacterial strains. Round shape sterile filter paper disk was prepared. Plant extracts were prepared in DMSO (stock: 1 mg/ml DMSO). The plant extracts of 25, 50 and 100 µl concentrations were added. The plates were then incubated at 37 °C for 48 h. The antimicrobials present in the plant extract are allowed to diffuse out into the medium and interact with the test organisms in the freshly seeded plate. The antifungal activity was reported after 48 h of incubation and compared with that of standard antifungal (Fluconazole) (10 µg/ml) which was used as positive control and DMSO as the negative control 12. Minimum Inhibitory Concentration: The Minimum Inhibitory Concentration (MIC) of ethanolic extract was determined as the lowest concentration of the plant extract inhibiting the visible growth of the organism. A sample weighing 1mg of each fraction was dissolved in 10ml of the fractionating solvent to form a solution having a concentration of 100 µg/ml. Other concentrations were obtained by taking 0.1, 0.2, 0.3, 0.4, 0.5, 0.6, 0.7, and 0.8 ml of the solution containing 100 µg/ml and adding 1ml of the solvent separately to obtain new solutions with concentrations 10 µg/ml, 20 µg/ml, 30 µg/ml, 40 µg/ml, 50 µg/ml, 60 µg/ml, 70 µg/ml and 80 µg/ml respectively. The concentration is necessary to cause minimum inhibition was then determined 13. Preliminary Phytochemical Screening: The present study carried out from Curcuma caesia rhizome sample revealed the presence of medicinally active metabolites. Important phytochemical considered as active medicinal phytochemical were present in the sample that shows a high level of its possible medicinal value. The Phytochemical evaluation was done for the presence of alkaloids, carbohydrates, glycoside, tannin, protein, and absence of steroid. 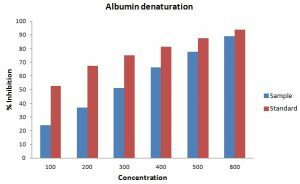 Inhibition of Albumin Denaturation: Denaturation of proteins is a well‐documented cause of inflammation. Phenylbutazone, salicylic acid, flufenamic acid (anti‐inflammatory drugs), etc, have shown dose-dependent ability to thermally induced protein denaturation. As a part of the investigation on the mechanism of the anti-inflammatory activity, the ability to extract to inhibit protein denaturation was studied. 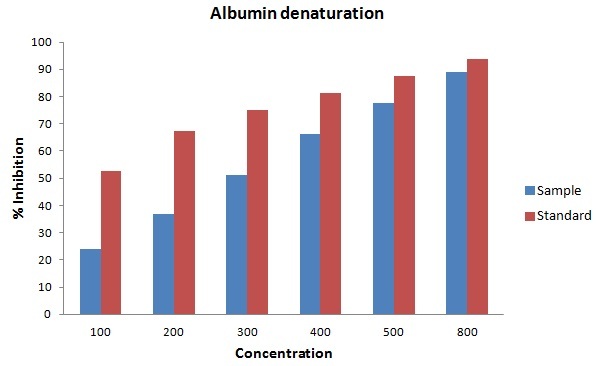 It was effective in inhibiting heat induced albumin denaturation at different concentrations as shown in Table 2. Test sample showed maximum inhibition 89% was observed at 800 µg/ml. Aspirin, a standard anti-inflammatory drug showed the maximum inhibi-tion, 93.75% at the concentration of 800 µg/ml. Membrane Stabilization Test: Stabilization of the RBCs membrane was studied to establish the mechanism of anti‐inflammatory action of Curcuma caesia further. The extract was effective in inhibiting the heat-induced hemolysis at different concentrations. These provide evidence for membrane stabilization as an additional mechanism of their anti-inflammatory effect. This extract may inhibit the release of lysosomal content of neutrophil at the site of inflammation. These neutrophil lysosomal constituents include bactericidal enzymes and protease, which upon extracellular release cause further tissue inflammation and damage. 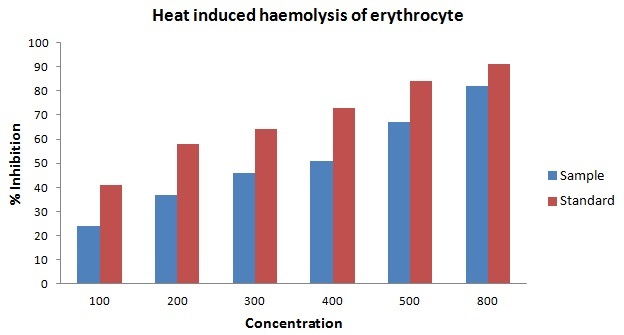 Test extract (100‐800 µg/ml) inhibited the heat-induced hemolysis of RBCs to a varying degree as shown in Table 3. It showed the maximum inhibition of 82% at 800 µg/ml. Aspirin, the standard drug showed the maximum inhibition 91% at 800 µg/ml. Proteinase Inhibitory Activity: Proteinases have been implicated in arthritic reactions. Neutrophils are known to be a rich source of proteinase which carries in their lysosomal granules many serine proteinases. It was previously reported that leukocytes proteinase play an important role in the development of tissue damage during inflammatory reactions and a significant level of protection was provided by proteinase inhibitors. 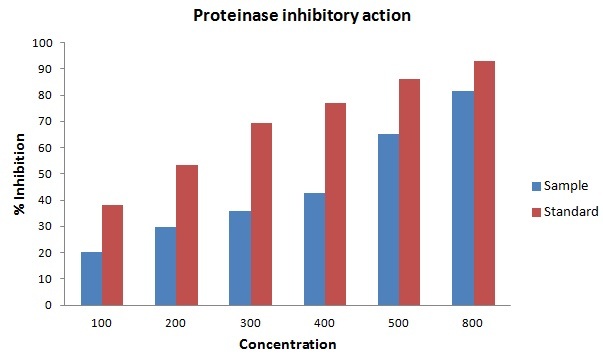 Curcuma caesia ethanol extract exhibited significant antiproteinase activity at different concentrations as shown in Table 4. It showed maximum inhibition of 81.39% at 800 µg/ml. Aspirin showed the maximum inhibition of 92.87% at 800 µg/ml. DPPH Free Radical Scavenging Assay: Free radical scavenging activity of Curcuma caesia and ascorbic acids were tested using the DPPH method, and the results are shown in Fig. 3. In this study, the free radical scavenging ability of each sample was evaluated by recording the change of absorbance produced by the reduction of DPPH. The percentage scavenging activity of each sample against DPPH ranged from 55.60 to 71.64% and 57.35 to 79.27% for Curcuma caesia, ascorbic acid, for Curcuma caesia and standard ascorbic acid, it was found to be 1.32 ± 0.04 μg/ml. The results obtained indicated that a higher percentage of DPPH. Scavenging activity may be attributed to the high reducing power and higher total phenolic contents present in Curcuma caesia. DPPH is a stable radical showing maximum absorbance at 515 nm. In DPPH assay, the antioxidants were able to reduce DPPH to yellow colored diphenyl picrylhydrazone (Frankel and Meyer, 2000). The method based on the reduction DPPH in alcoholic solution in the presence of a hydrogen donating antioxidant due to the formation of the nonradical form DPPH-H in the reaction. DPPH is usually used as a reagent to evaluate free radical and accepts an electron or hydrogen radical to become a stable diamagnetic molecule 14. Nitric Oxide Radical Scavenging Assay: Incubation of solutions of sodium nitroprusside in phosphate buffer saline at 25 °C for 150 min resulted in the generation of NO. The Curcuma caesia effectively reduced the generation of NO. The IC50 was found to be 34.50 ± 1.48 µg/ml for Curcuma caesia and 186.46 ± 3.37 µg/ml for ascorbic acid Table 7. These observations further highlight the importance of Curcuma caesia in preventing physiological deletoriation caused by NO and O2 radicals 15. Hydroxyl Radical Scavenging Activity: The ability of Curcuma caesia to scavenge Hydroxyl radical is shown in Table 7 and compared with that of ascorbic acid as a reference compound. Hydroxyl radical scavenging activities of Curcuma caesia and ascorbic acid are 18.20 to 29.13% and 30.9 to 77.15%, respectively at the same concen-tration. The IC50 was found to be 9.08 ± 2.21 μg/ml for Curcuma caesia and standard ascorbic acid, it was found to be 47.50 ± 1.54 μg/ml 16. Antimicrobial Activity: The antimicrobial activity of the ethanolic extract of Curcuma caesia under different concentration with the standard appear in Table 6. The ethanolic extract rhizomes showed antimicrobial activity against a large portion of the test organ. The ethanolic extract of rhizomes of Curcuma caesia was exceptionally successful towards the majority of the Gram-positive microbes, Gram-negative microscopic organisms, and fungal strains in agar well diffusion strategy. The exhibit of antimicrobial activity against both Gram-positive and Gram-negative bacteria and on various fungal strains might be demonstrative of the presence of broad-spectrum antibiotic compounds in the extract which is clearly shown in Table 6. The 100 µg/ml concentration of extract having the most affecting antimicrobial activity 17. The minimum inhibitory concentration was recorded in Table 7 and found to be 20 µg/ml. The results revealed that ethanol extract of rhizomes of Curcuma caesia has potent antibacterial activity. This may be due to the presence of some inhibitory compounds (secondary metabolites) or factors present in the plant extracts. CONCLUSION: Based on the present study it can be concluded that the ethanolic extract of Curcuma caesia showed the presence of various phytochemicals of which alkaloids, saponin, flavonoids, carbohydrates, glycosides, Steroids, proteins, and amino acids and tannins. Ethanolic extract of the rhizome of Curcuma caesia posses in-vitro anti-inflammatory activity which might be attributed to the presence of various phytochemicals in the extract. The result of anti inflammatory studies showed that inhibition of albumin denaturation, membrane stabilization and Proteinase inhibitor at the highest concentration of 800 µg/ml confirms the rhizome of Curcuma caesia are a potent inhibitor of acute and chronic inflammation. Curcuma caesia possesses strong antioxidant activity as evidenced by the free radical scavenging property, can be a very effective antioxidant and can protect biological systems against the oxidative stress that is found to be an important pathophysiological event in a variety of diseases including aging, cancer, diabetes, cardiovascular disorders, and rheumatoid arthritis. This may be due to the presence of phenolic components in the Curcuma caesia. Overall, Curcuma caesia is a source of natural antioxidant that can be important in disease prevention and health preservation. The antimicrobial activity of the rhizomes of Curcuma caesia was evaluated by using the disk diffusion method. The microorganisms chosen to be studied Gram positive, S. aureus and Gram-negative E. coli and fungus like C. albicans. This microorganism were chosen to be studied as they are imperative pathogens and furthermore because of quickly created anti-microbial resistance. The plant extract possess antimicrobial activity. Therefore it’s ethnomedical claims was true according to the above experimental results. This gives support to the claim for the traditional use of the plant in the treatment of inflammation. The result of the study has seen to provide support for the use of Curcuma caesia. To promote proper conservation sustainable use of such plant resources, awareness of local communities should be enhanced incorporating the traditional knowledge with scientific findings. 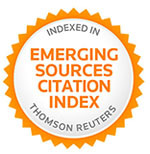 ACKNOWLEDGEMENT: Authors are thankful to the Institute for providing us the facilities required for the concern work. Das S, Mondal P and Zaman K: Curcuma caesia and it’s medicinal uses: A Review. Int J Res Pharm Chem 2013; 3(2): 370-375. Koosirirat C: Anti-inflammatory effect of Curcuma longa in Helicobacter pylori-infected Int Immuno-Pharmacol 2010; 10(7): 815-8. Buragohain J: Ethnomedicinal Plants used by the ethnic Communities of Tinsukia District of Assam, India. Rec Res Sci and Tech 2011; 3(9): 31-42. Donipati P and Sreeramulu SH: Preliminary Phyto-chemical screening of Curcuma caesia. Int J Curr Microbiol App Sci 2015; 4(11): 30-34. Saxena J and Sahu R: Phytochemical constituent in species of Curcuma. 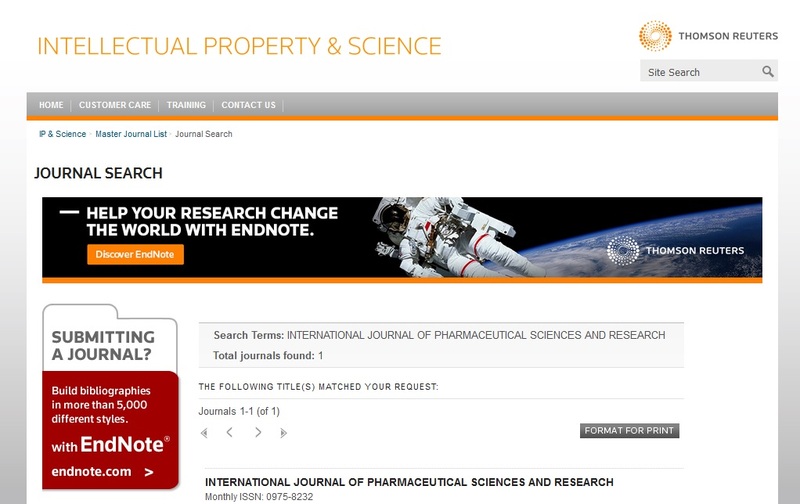 Int Res J Pharm 2012; 3: 203-204. Sakat S, Juvekar AR, and Gambhire MN: In-vitro antioxidant and anti-inflammatory activity of methanol extract of Oxalis corniculata International Journal of Pharma and Pharmacological Sciences 2010; 2(1): 146-155. Selvam R, Subramanian L, Gayathri R and Angayarkanni N: The anti- oxidant activity of turmeric (Curcuma longa), Journal of Ethnopharmacology 1995; 47(2): 59-67. Chetia P, Bala A, Khandelwal B and Haldar P: Comparative in-vitro Free radical scavenging property of q-carotene and naringenin concerning vitamin C and n-acetylcysteine. Pharmacologia 2012; 3(12): 24-28. Ge-Qin S, Hai-Li L, Lan-Fen L, Wang J, Han-Zhong Y, Xiu-Juan W, Xue-Qin F, Guo-Fang T, Yi-Fei M, and Xiu-Ming Z: Comparison of the antimicrobial activity of the curcumin derivatives between Fm0817 and Fm04. International Journal of Core Engineering & Management 2016; 9(6): 12130-12134. Devi HP, Mazumder PB and Devi LP: Antioxidant and antimutagenic activity of Curcuma caesia rhizome extracts. Toxicology Reports 2015; 2: 423-428. Tanvir EM, Hossein S, Hossain F, Afroz R, Gan SW, Khalil I and Karim N: Antioxidant properties of popular turmeric (Curcuma longa) varieties from Bangladesh. Hindawi Journal of Food Quality 2017; 1: 1-8. Tsai SY, Huang SH, Chyau CC, Tsai CH, Weng CC and Mau JL: Composition and antioxidant properties of essential oils from Curcuma rhizome, Asian Journal of Arts and Science 2011; 2(1): 57-66. Sukanya SL, Sudisha J, Hariprasad P, Niranjana SR, Prakash HS and Fathima SK: Antimicrobial activity of leaf extracts of Indian medicinal plants against clinical and phytopathogenic bacteria. Afr J Biol 2009; 8: 6677-82. Kalita V, Pegu P and Chetia P: Phytochemical screening and evaluation of antioxidant, anti-microbial and anti-inflammatory activity of "Curcuma caesia". Int J Pharm Sci & Res 2019; 10(2): 846-55. doi: 10.13040/IJPSR.0975-8232.10(2).846-55. Authors Address: Girijananda Chowdhury Institute of Pharmaceutical Science, Azara, Hatkhowapara, Guwahati, Assam, India.